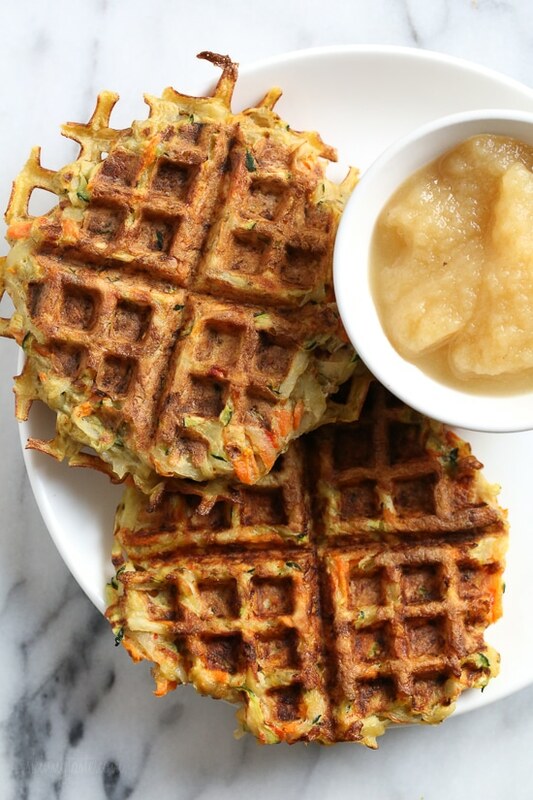 These veggie-packed latkes, are not your traditional latkes, they’re made with shredded potatoes and a mix of carrots, zucchini and bell pepper, PLUS they’re cooked in a waffle iron so there’s no need to fry! What to serve with latkes is completely up to you, my favorite is with sour cream, lox, capers and red onion, or simply with apple sauce on the side. 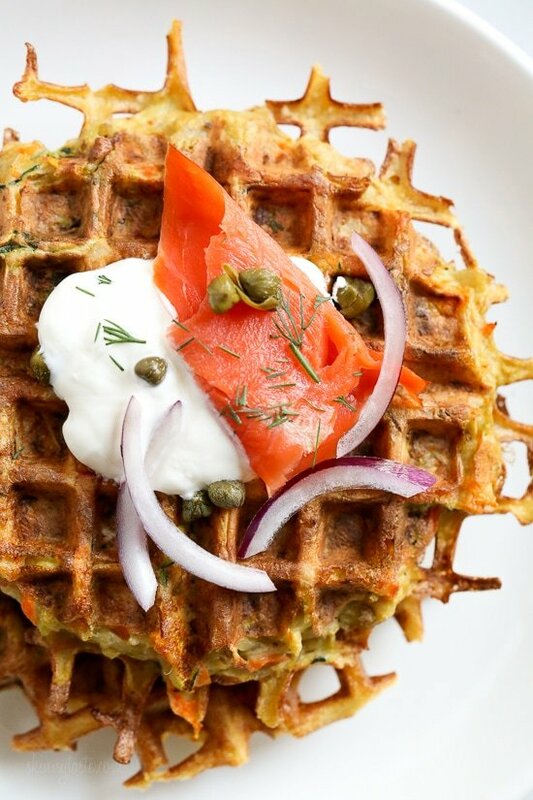 Using a waffle iron to make latkes is a game changer. The edges come out crisp and since you’re not deep frying them, the only oil you need is to spray the waffle iron. 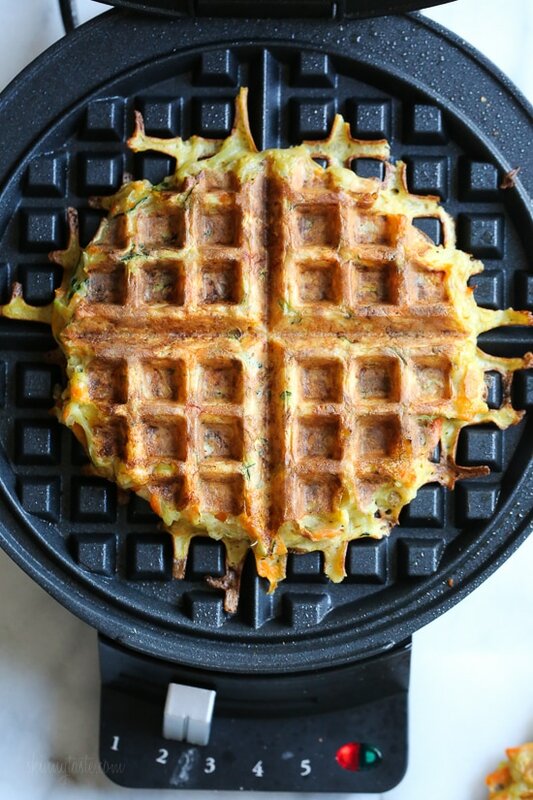 I have a basic round Cuisinart Waffle Iron (affiliate link) that I’ve been using to make everything from waffled crab cakes, grilled cheese, and more! Funny think is I never make waffles in it. Shred the vegetables in a box grater and squeeze all the excess liquid out using paper towels or a cheese cloth. The potatoes brown fast so that is the last vegetable I grate. Once you make the batter it’s best to work quick as the vegetables will continue to release liquid if they sit to long. Set your waffle iron to medium-low, let it get hot, spray generously with oil and add just under 2/3 cup batter. Close tight for about 5 minutes so the center cooks. Which Potatoes are Best for Latkes? I like using Russet potatoes but I’ve also made them with Yukon Gold. For a sweeter latkes, you can also use sweet potatoes. 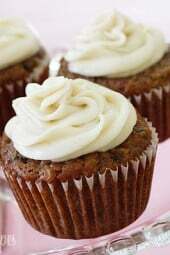 These can easily be made gluten-free with an all purpose gluten-free flour mix. 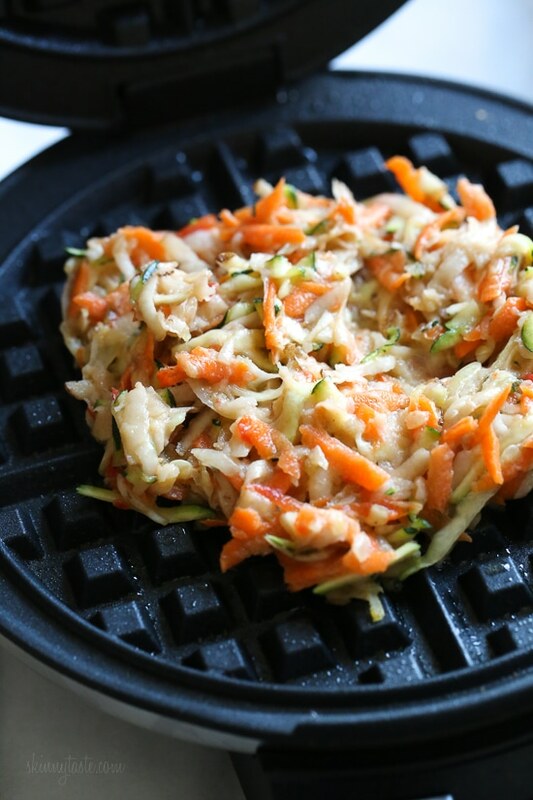 These veggie-packed latkes, are not your traditional latkes, they’re made with shredded potatoes, carrots, zucchini and bell pepper, and they are cooked in a waffle iron so there’s no need to fry! Top them with sour cream, lox and capers or with apple sauce on the side. Using a box grater, grate all the veggies, saving the potatoes for last to prevent browning. Squeeze out all the excess liquid well with a cheese cloth or towels. Stir in matzo meal or flour, baking powder, salt and pepper. Add the eggs and mix well. Spray waffle iron and heat on medium-low heat. Place scant 2/3 cup in the center of the waffle iron and close, cook 5 minutes, until browned and crisp on the edges and cooked through in the center. Set aside and repeat with the remaining mixture. All I had in the house was sweet potatoes, zucchini, and mushrooms, and I threw in garlic powder and onion powder. I may never make a different recipe for breakfast ever again! And my kitchen smelled heavenly while it was cooking too! These are delicious. I had to cook mine for 7-8 minutes for them to brown. I will definitely make them again. I loved the ideas for these and, while they were very delicious, they did not hold together for us very well and did not become crispy. They were very good topped them with sour cream! Mine didn’t turn out crispy 🙁 Any ideas why? Also, I found they were better without soda. Great idea though. Delicious,! My 12 year old son loves them too! I put peach salsa and sour cream on top and they were excellent! Will make these many times. I made these tonight as I had a hankering for Chicken and Waffles. I am extactic with how they came out! 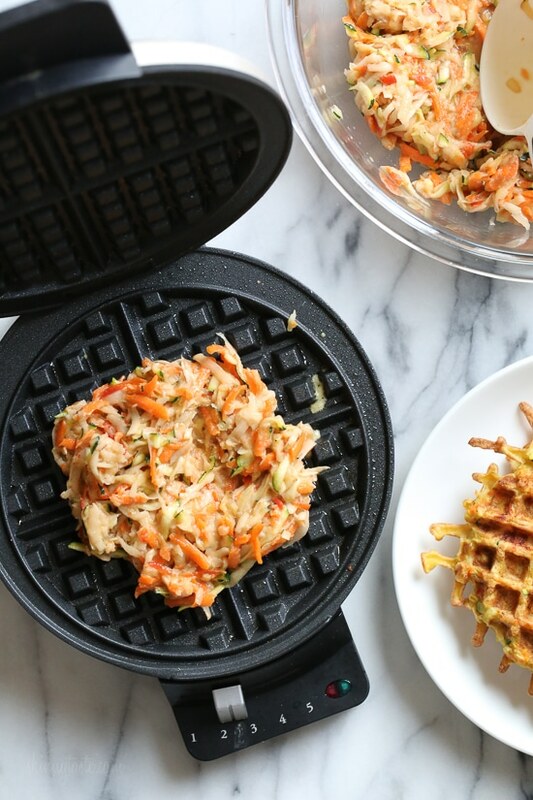 I didn’t miss the old fashioned waffles at all and it’s a great way to sneak veggies into your meals. I will absolutely make this again, probably even this week! I did just that with these. I reheated them in a toaster and they were great. Eight waffles x 5 minutes per, plus prep and clean-up equals a long time for some waffles. Taste? Great. “Very crispy”? Not quite. Next time I’ll try to squeeze out even more liquid. Help! What went wrong?! Made these tonight and couldn’t even eat them. The waffles never got “done.” They just stayed a big mush no matter how long they cooked. What should I try? 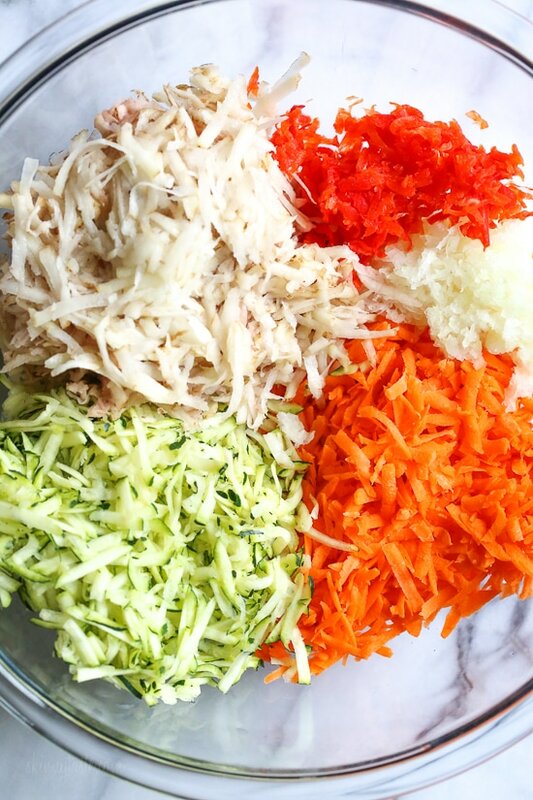 Salt the shredded vegetables and leave them in a colander for 10 or 15 minutes. Then wring them out in a cotton towel or cheesecloth as much as you can. The salt pulls moisture from the cells of the vegetables through osmosis, but it will reabsorb if you leave it for too long. I just made these and they are fantastic! In order to ensure that I would pull out as much moisture as possible, I shredded the onion and zucchini and then mixed in about a teaspoon of kosher salt. I left out the bell pepper, but if your using it, then throw it in with the zucchini and onion. Then I put that in a fine mesh strainer in the sink while I prepared everything else. Maybe ten minutes total. The salt pulls moisture out of the cells of the vegetables through osmosis. I would HIGHLY recommend doing this. After I peeled and shredded the carrots and potato, I put all of the veggies into a plain cotton towel and wrung any additional water out. I also added about half a teaspoon each of onion powder, garlic powder, and smoked paprika. The flavor came through nicely. I have eaten two so far. One I served with extra sharp cheddar and the other with feta. I liked both, but preferred the feta. I topped the cheddar latke with Persian blue salt and the feta latke with Inca sun salt. The little bit of crunchy salt on the top is excellent. I recommend using whatever nice, crunchy salt you have even if it’s just kosher salt. Just finished eating this for dinner and it was delicious!! I loved the flavor that the mix of veggies added 🙂 I also really appreciate that you included the exact measurement for salt, as I have trouble seasoning a mix with raw eggs! The salt level was perfect for my taste. I actually doubled the recipe (so much shredding/squeezing water omg) and am working on the rest in my waffle maker right now! I think they will freeze really well to be toasted later (maybe will be even crispier), and that makes for some really easy, light dinners. This was the perfect start to 2018 after over-indulging on food and drinks during the holidays <3 Cheers Gina and Happy New Year! These were so good! My family decided to learn about Hanukkah and so during Hanukkah, we made these and read about the traditions of the holiday. I do understand that a fried latke would have been more authentic for my experience, but this was perfect for me because I try to “healthify” everything. So delicious! We had them with sour cream, dill, capers, and smoked salmon on top. I will absolutely make them again! Love all of your recipes! I’ve been cooking them for over 5 years! Question… when I enter this in the calculator, it says 6fsp for 2 latkeys. Is that correct? thanks! You cant use the calculator with all the 0 point veggies, it will count them. You have to use recipe builder. If you were to substitute Cauliflower crumbles for the potatoes, would you just need to use 16 oz of them? PS – Thank you for all of the amazing recipes! These look fantastic, and we plan to make them tomorrow for the first night of Hanukkah. But a quick question: Our waffle iron is a belgian-style one (extra thick). Do you think that would work okay, or would it be better to just pan-fry in a little cooking spray? To be honest, I am not sure but my guess is it should be fine! Just made these for Hanukkah… delicious! We decided to pan-fry them on our cast-iron skillet with cooking spray, but otherwise followed the recipe exactly. The only problem is that these are a lot more than 3 Smart Points because it’s impossible to stop after 2. Thanks for a great recipe!!! I just made these and they came out SO GOOD! I made 6 instead of the 4 using 1/2c servings! I wonder if you could use other potatoes to keep the points lower? I was shocked that 2 large russet potatoes are 16pts! can I use a Belgian waffle maker? 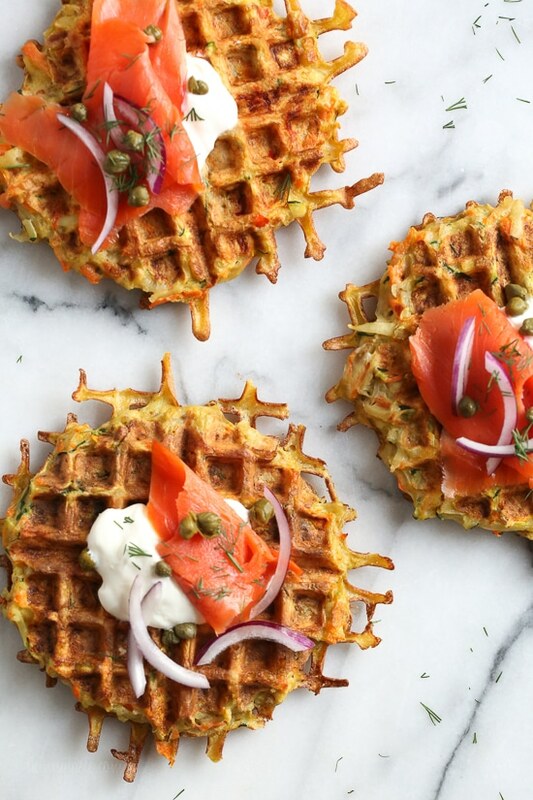 I don’t have a waffle iron – do you think I could make these in a skillet or even in an oven? Hi! I am very excited to try out this recipe for Chanukah next week. What are your thoughts on using a blender or food processor instead of the box grater? Maybe a food processor, not a blender. and I think the novelty of the “waffle” will make these a hit. I plugged the recipe into the WW recipe builder because I wasn’t sure if if the Smart Points total reflected the new Freestyle program. I was thinking that with the eggs now being zero points, the total points per serving might go down. I actually found that they went up–it’s claiming that the total per serving is 5. (Not a criticism and I’m still making them, but I thought I would mention it!) 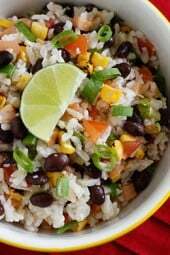 Thank you for all the wonderful recipes in your cookbook and site–I’m a first-time commenter but longtime fan! The only ingredients with points are 16 oz. raw potato , which is 10 points and the 1/4 c. of matzoh meal, whicich is 3. That’s 13 points for 4 servings. 3 points per serving. Can’t wait to try!! Any suggestions or warnings about keeping them warm while you’re making thebrest? I only have one waffle iron so the first ones will sit a while. i would like to make these ahead and serve to guests later. Could i freeze them and rewarm them in the oven? I have not tried to see if they would still be as good. These are so delicious! And so easy that my not-quite-nine-year-old made them herself!!!! Just finished off the leftovers for lunch. So tasty! Could you use a panini press instead of a waffle iron? Can you use just potatoes omitting carrots and squash? sure but you would have to add more to compensate. 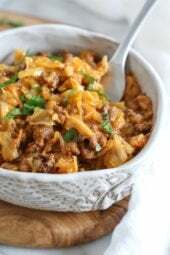 Was wondering if you think a bag of frozen shredded potatoes ( hash browns) would work in this recipe. I thought it might save a little time. I have not tried but it might be fine! I’ve found they sometimes have a mealier texture, but I’d give it a go! Might be best to thaw them and wring out excess water before adding to the mixture. Love a good time (and mess) saver! Very excited to se e this post.. if you were to freeze these, how would you reheat them. Hash Browns frozen work great. Put them in the microwave for 1 minute on high covered and then proceed with you recipe. I make hashbrowns occasionally. I usually saute peppers, onions and mushrooms and add them to the hashbrowns…..make in the waffle iron and they are delicious. Takes about 8 minutes. Super intrigued! But wondering what shape the waffle iron is in following this process. Do waffles come out smelling like onions? We all know that latke smell is pretty intense! 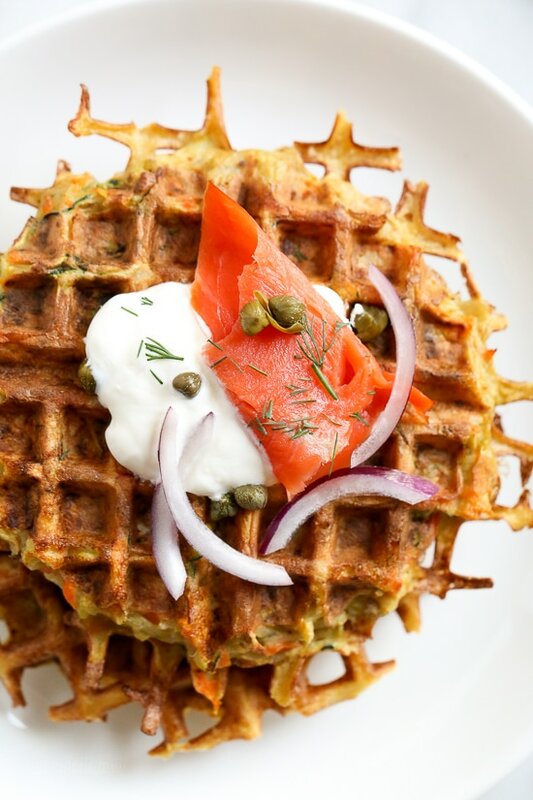 I used a Belgium waffle maker- Latkes smelt incredible while making! Sounds like cauliflower could be substitute for potato? for us Low Carb creatures! This sounds delish! Took me back to days an old flames mother used to make these. I hadn’t had them since so quite happy to see this recipe, thank you. I can’t wait to try this, thank you Gina!!! PS Are you working on a new cookbook? Can’t wait to add another one to my collection. Thanks yes comes out next Fall! I am going to buy a waffle maker for this recipe. I would prefer to buy the cuisinart Belgian waffle maker…would that waffle make work ok with this recipe or do you need a plain maker? I don’t have one so I am not sure? I have a Belgian Waffle maker (it’s about 20 years old), and it doesn’t have a heat control, so that might be one drawback. What would be a substitute for potatoes? Do you know what the substitution ratio would be this way? Same amount of all purpose flour mix. Think these would freeze as well as waffles do? These look wonderful! Can’t wait to try them! Thanks Gina, your recipes make my weight loss journey so easy!! Hi, I really appreciate that you go to the trouble to calculate the WW Smart Points. Could you tell me, are you now calculating using the “Freestyle” system — ie, eggs are zero points? Thanks much. Yes, in this recipe and all of 2017. I am working my way through the list. Thank you Gina!!!!! We appreciate all that you do! I love your recipes! Great WW program change but it causes us all to take time and retool everything – LOL…. Gina, are you saying all recipes posted in 2017 have been updated to reflect the new Freestyle SP? Do you think you will be able to update the SP lists for your recipe books? I cannot imagine how much work that will be, but if you are able to update, that sure would be awesome! I have and love both of your cookbooks. Can’t wait for the new one to come out! Yes, the books are all updated with the new SP. I don’t have a waffle iron, do you think a panini press might work? I made them in my George Forman and they came out great! Also used almond flour instead of regular flour. Great rexipe will definitely make them again! Perhaps a “flax egg” might work too? Mix 1 tablespoon ground flax meal with 2.5 tablespoons of water = 1 egg. Mix flax meal and water well and let sit for several minutes before adding to recipes. So excited to try this! My husband does not like bell peppers. Might just eliminate those. Sweet potatoes might be a good add as well! Love your recipes! I like to use my food processor to grate carrots. Could I use my processor instead of a box grater? Can these be made with cauliflower instead of potatoes. I think my Jewish grandfather would roll over in his grave, and my kids would make faces, but these look very interesting and I am game to try. I’m sure they’re delicious, and without all that oil, I’m going to try to them! These look fantastic! The perfect way to get my child to eat more veggies! I realize that this is not a vegan recipe but I was wondering what you could use in place of the eggs? Thank you. Just made these tonight and used ground flax and water (1tbsp flax, 3tbsp water=1 egg) and they turned out perfect ??????? ?